The toll road authority says this photo shows my Royal Enfield. I suppose I should be flattered that the Florida Department of Transportation thinks I can ride my Royal Enfield motorcycle on its high-speed toll roads. My Enfield is too slow for the super slab. We stick to the side streets. So I know it wasn't my motorcycle that is pictured roaring through a toll booth on the Turnpike the night of Jan. 14. My Enfield was safely in the garage that night. But Florida's Toll-by-Plate system thinks the picture shows a motorcycle with license plate 68842L racking up a $3.50 toll charge. That's not the number on my Enfield now, but it is the number my Enfield used to wear before it was issued a new license plate, customary every few years in Florida. Motorcycle plates are small. 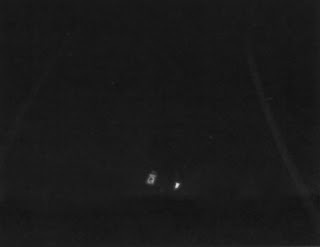 It's a miracle that the toll road authorities think they can get a clear photo of one moving through a toll booth, at speed, in the dark. My guess is that, in this case, they didn't. The offending motorcycle probably had a similar, but not identical number. They've got the wrong guy. I'm innocent! But if I don't pay, in full, the toll charge turns into a traffic citation and I become a law breaker. And it's not the first time this has happened. Last time it was one of my cars, charged a toll on a road I've never traveled. In that case, the photo clearly showed the error and the customer service person who answered the phone let me off the hook. Not this time: the clerk admitted that she couldn't read the license number in the photo but she obviously still considered me guilty. There would be an investigation, she said. For now, at least, I am an Outlaw Biker — or, at least, my license plate is. If you have any cell phone records from around that time, you can use that to prove you were not in the area. I don't see ANY characters, and they think they came up with 6? They should run the photo through the software 6 more times and see if it comes up with the same plate even twice. Great comment, Alan. UPDATE: FDOT called this morning to say that the case has been closed. They're letting me off the hook. When I gently pressed for details about what caused the false positive the representative became uneasy and implied that it was not just a matter of one or two numbers: she seemed to say that they couldn't read the plate at all. But she would not be specific.